*Author's Note: At the time of this writing The Sun Makers has yet to be released on DVD. This review is based on the VHS copy obtained courtesy of the El Paso (Texas) Public Library. Yes, some people STILL have VCRs. Due to that fact, I've opted to write a review for it now rather than wait for said DVD release. The Sun Makers, written by Robert Holmes (voted by Doctor Who Magazine readers as the 3rd greatest contributor to Doctor Who and the highest ranking author*), evoked memories of two George Harrison songs: Here Comes the Sun and Taxman. I don't think they served as inspiration for the four-part story. Instead, Holmes' own problems with taxation served as source material for the story, which proves a a valuable lesson to us writers: draw from what you experience and expand on that. I think almost everyone dislikes taxation, but it took a creative force like Holmes to bring a brilliant science-fiction element to this most dreadful of dilemmas. The Doctor (Tom Baker) and his Companion Leela (Louise Jameson) arrive on Pluto. Far from being a frozen, dead planet (in 1977 when The Sun Makers premiered Pluto was still officially the ninth planet of the solar system and for full disclosure I still consider it a full planet) Pluto is warm and inhabited. The source of life is courtesy of six engineered suns that warm the planet, but instead of a paradise for the human settlers, it is a virtual gulag. The citizens, overworked and overtaxed, live within the bowels of the planet, to the point where it is forbidden for them to go outside to see the suns. Only the elites, those at the upper echelons of The Company, are permitted that privilege. The travelers encounter Cordo (Roy Macredy), a simple D-Level worker who simply cannot pay all the taxes incurred by the death of his father. 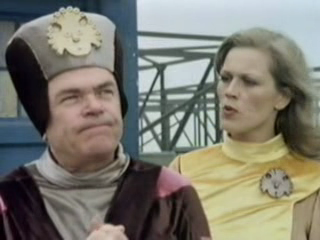 He is just about to commit suicide by jumping off the roof when The Doctor and Leela pull him away. Within minutes they are being pursued by Gatherer Hade (the appropriately named Richard Leech), who is the head of that sector of Pluto. Hade believes the travelers are part of The Others, a group of tax rebels. Cordo and the crew do get to The Others, but they in turn are suspicious of them, thinking they're agents of The Gatherer and his head, The Collector (also appropriately named Henry Woolf). 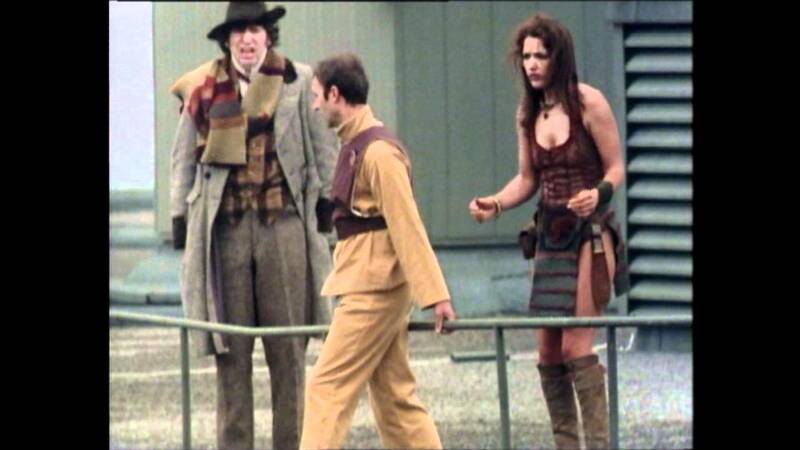 The Doctor and Leela eventually win The Others over with a mix of the former's intelligence and the latter's warrior instinct and join with the rebels to overthrow the tyranny of The Company. The brilliance of The Sun Makers comes from the universality (no pun intended) of the situation. Everyone is aware of taxes, everyone dislikes paying them, and everyone therefore can relate to the sense of oppression that taxes can bring. We also understand the sense of entitlement that those in the highest tax brackets have. It may not have been the intent of Robert Holmes, but I couldn't help think of the Soviet system while watching the program. Like the former Soviet Union, the majority of the workers were economically suppressed perhaps not with excessive taxation but in the equal distribution of misery. There, as in the Pluto of the story, a small group controlled the resources and lives of the majority. To my mind, this correlation between Pluto and the USSR is made clear whenever the functionaries or citizens automatically proclaim, "Praise The Company!" whenever The Company is named. I also thought back to the excesses of the ancien regime just before the French and Russian Revolutions, especially when the population refers to one another as "Citizen" (which is how the French addressed each other after the fall of the monarchy and a close cousin to the term Comrade). At the heart of the greatness of The Sun Makers are the performances. Let's focus first on the guest stars. Leech is a delight as Gatherer Hade. He brings a completely comedic turn when he's the bureaucrat indifferent to the problems of the citizens or whenever he's hopelessly crawling to The Collector. The excessively lavish titles he gives The Collector in his presence become more and more outlandish and consequently more and more comical, but rather than distracting they add a great touch to the story. Admittedly, Woolf's Collector might now look like Mini-Me's slightly crazed cousin, but he also manages to be both comedic and menacing. His voice (a thin, tiny voice) matches the small-mindedness and greed of The Collector, and as the growing revolt slowly spins out of control he quite literally starts spinning in his chair. It's his malevolence that makes The Collector so dangerous, his perception of people as just cogs to fuel his profit margin that makes him evil. Side note: I saw elements of Metropolis in The Sun Makers, specifically in how the workers were treated. Perhaps I'm the only one, but again I digress. Macredy is also to be commended for his Cordo. He has the greatest character arc in the story: in Episode One he's a weak, frightened, timid man, but by Episode Four he's (mostly) overcome his fears to be a leader of the revolution. David Rowland's Bisham, who is a higher-level worker on Pluto and helps start the revolution, isn't as strong as he could have been, as is William Simon's Mandrel, leader of The Others. Let's move on to the leads. Tom Baker (who was ranked Number 4 on that same Doctor Who Magazine list and the highest-ranking Doctor of the three to make the Top Ten**) has a face children can trust. He brings a combination of eccentricity and joy at adventure that makes him excellent in his performance. Baker exudes confidence that his plans will work but who does not flinch from danger. Jameson's warrior princess Leela (voted the 7th favorite Companion of all time in that same poll) is the perfect counterpoint to Baker. She is a full warrior, down to her way of relating to the world (when she meets with The Others, she tells them that Cordo "wishes to join your tribe"). She's strong and fearless, but her strength should not be confused with toughness (a quality better used to describe the 6th favorite Companion, Ace from the 7th Doctor's time, but I digress). Jameson makes Leela more than just a "kill first, don't ask question at all" brute. She has in her performance almost an innocence to her. When trying to understand why she and The Doctor fled when they heard The Gatherer was coming, she remarks "Perhaps everyone runs from The Tax Man". To deliver a line like that without breaking character is a sign of a strong and steady actress. Leela: These taxes, they are like sacrifices to tribal gods? The Doctor: Well, roughly speaking, but paying tax is more painful. The best stories work when they maintain the balance of comedy and adventure, and here, they complement each other brilliantly. The seriousness of the oppression the citizens of Pluto face is not overwhelmed by the funny lines of dialogue. Holmes wrote a wonderful adventure story as well as a biting satire on excessive taxation and the oligarchy that can emerge from such a system. If there's anything to complain about the script, it has to do mainly with Leela's near-execution, which felt a little stretched, as was the Doctor's capture and near-brainwashing. In the end, these are little things that don't take too much away from the story. On the technical side, director Pennant Roberts kept things moving at a steady pace where by the end of Episode Four you don't realize nearly two hours have passed by if you watch the story in one go. Christine Rawlins' costumes were excellent: The Gatherer's lavish wardrobe (complete with elaborate hat) was impressive in itself, but so were the plain uniforms of Citizen-D level workers and the rags of The Others. Tony Snoaden unfortunately didn't get as much attention with his sets (apart from The Gatherer's office and the execution chamber) but this was beyond his control. There was a lot of location work in The Sun Makers, and at times frankly this was a bit of a distraction (sometimes the corridors to The Collector's Palace looked like a large hospital hallway). Again, we should remember that Doctor Who was not the most lavishly-financed production, so given their limited budgets Rawlins and Snoaden created wonderful work. Dudley Simpson's music can always be counted on to be excellent, and here again he doesn't fail. There are a few things to criticize about The Sun Makers. The effects weren't at times very convincing (when a guard is electrocuted especially so). When The Gatherer is thrown off the building is also a point of failure. It's obvious that it is a dummy (and a very unconvincing one at that). It also brings into question whether it was a good decision to in essence kill someone via mob violence. I wonder what kind of message that sends. In retrospect I think The Gatherer could have been taken prisoner and Cordo and company declare that he would be tried for his actions. Mob violence is something that should not be cheered, and I understand this caused some controversy when it originally aired, and frankly I side with those that thought this was going too far. The Sun Makers was clever, witty, and a great deal of fun. In short, watching it is quite pleasurable and in no way taxing. * Russell T. Davies was voted Number 1 of the Greatest Contributors to Doctor Who, and he is a writer, and he is a very good one. However, his primarily role was as executive producer for the revived series while Holmes was primarily a writer and was secondarily a Script Editor in the classic series. The fact that Davies wrote Love & Monsters (which I consider the WORST Doctor Who story of all time, which got me to stop watching Doctor Who for at least two years, and which I shall always loath in my memory for time and eternity) knocks him down in my mind, though I won't argue his importance in Doctor Who. **William Hartnell (The First Doctor) and David Tennant (The Tenth Doctor) were the other two Doctors to make the list at Numbers 7 and 9 respectively. Patrick Troughton was ranked 14th when the list was expanded to the Top Twenty.